We've had some challenges. We've made some adjustments. 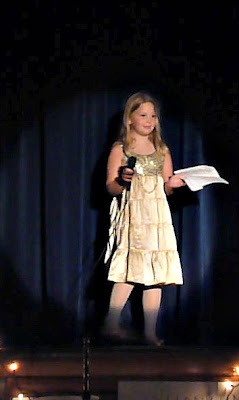 After Katie was unable to perform in her dance recital this spring - a recital she had looked forward to for months and months - I concentrated on having her look forward to her summer camp talent show. She was relatively unphased by not getting to continue dance lessons. She didn't really care to learn specific steps anyway. She knows how to move and she just wants to watch herself in the mirror and be on stage to show the world. Last year she sang Bruno Mars' "Marry You" with a friend to thunderous applause. Unfortunately, I had a video camera malfunction. You'd think I would have been totally prepared this year. With my camera ready to go, the lights went dark before I expected them to. Then I realized I had my new camera that worked slightly differently and I started sweating. I finally got myself together at the almost beginning of her performance. Of course it's shaky in the beginning since Timmy the wierdo had to grab my hand away from the camera to rub his inner thigh at that particular moment. So hold on to your seats, ladies and gentlemen. Boys and girls, grandparents, aunts and uncles. Friends. Katie finally got her stage performance. And what a performance it was. P.S. She was concentrating very hard on her dancing. You can see her stopping herself a few times. See, her natural inclination to spin and spin had gotten her a little wound up on the microphone cord during rehearsal and she was told "no spinning allowed." This is soooo sweet. What a beautiful, talented girl! Seriously, she moves better than me. WOW - she's precious! I LOVE LOVE LOVE the dress... she looks like an angel. Great moves and awesome spirit. Thanks for sharing a sweet story. That has to be the cutest thing I've seen in a long time! Good for her!!! She is a wonderful performer! Way to go Katie!